EcoSmart is a well-known company that aims at providing an eco-friendly product for everyone. They started as a small company that took it upon itself to produce green energy products as a replacement for energy-consuming appliances like storage tank water heaters. Besides, EcoSmart has been known for its excellent support and special attention to details when it comes to customer needs. Their products are distributed throughout the western hemisphere through many official partners that include big names like Amazon, Home Depot, and True Value. EcoSmart’s products comply to North American safety Standards, which is reflected through their ETL CERTIFICATION to UL 499. That should be enough to show their professionalism and how much they care about safety. EcoSmart’s products are simple, compact and durable. All the inner components work together to achieve durability, ease-of-use and great functionality. EcoSmart is known for quality, and that’s clearly reflected in the design of their products. They even feature an automatically resettable thermostat, as opposed to the manually resettled one provided in other products. EcoSmart’s whole-house electric tankless water heaters feature a digital display that shows temperature settings, which can be controlled in increments of 1ºF and ranges from 80º to 140º F. Using the controls is as easy as pie, and once you set it, you don’t have to keep rechecking it. 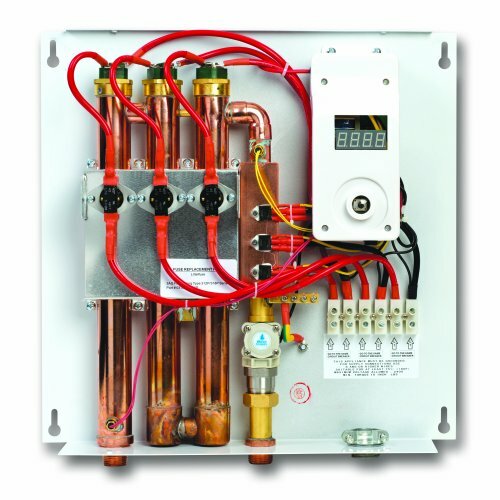 The Emerson Electric heating elements of EcoSmart’s tankless water heaters are made of copper or stainless steel, both of which are known for durability and strength. Besides, these elements come with a brass on top that’s also made of stainless steel or copper, and that takes care of stopping electrolytes and easy screw in and out of the top of the exchangers. EcoSmart’s tankless heaters use either gas or electricity as a fuel, and they either are central units or Point-Of-Use ones. There isn’t really a best solution here, as it all depends on your preferences and needs. What’s the difference, you’re asking? According to the Department of Energy, water heating takes 14% to 18% of our utility bills, for that cost is an essential factor to consider. The cost of an electric tankless water heater is usually less than that of their gas counterparts, especially for central units, but that’s for the initial price. Other expenses may be added during the installation and maintenance processes, which will be detailed below. 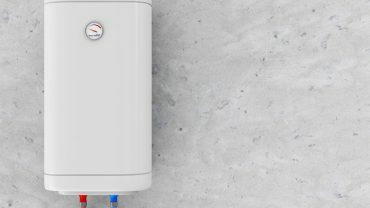 Installing a gas water heater can be expensive as they usually require side venting and pipelines upgrade as already-installed ones are often insufficient to cover the energy requirements of the appliance. A typical gas water heater usually requires 1/2″ pipes, while a tankless one needs 3/4″. On the other hand, electric tankless water heaters are small and don’t require much modification and can be installed in a closet, a crawl space, under the sink or anywhere close to the point-of-use. The efficiency of a gas tankless water heater usually peaks at 85%, while that of an electric counterpart can reach 98%. On the other hand, natural gas is a cheap fuel compared to electricity in terms of BTU of output power. That’s mainly because gas burns harder, which makes electricity far more efficient with minimum energy waste. Electric tankless water heaters provide hot water on demand, for that the house must have a 200 AMP, 208 to 240-volt electrical service to handle the occasional power peaks. 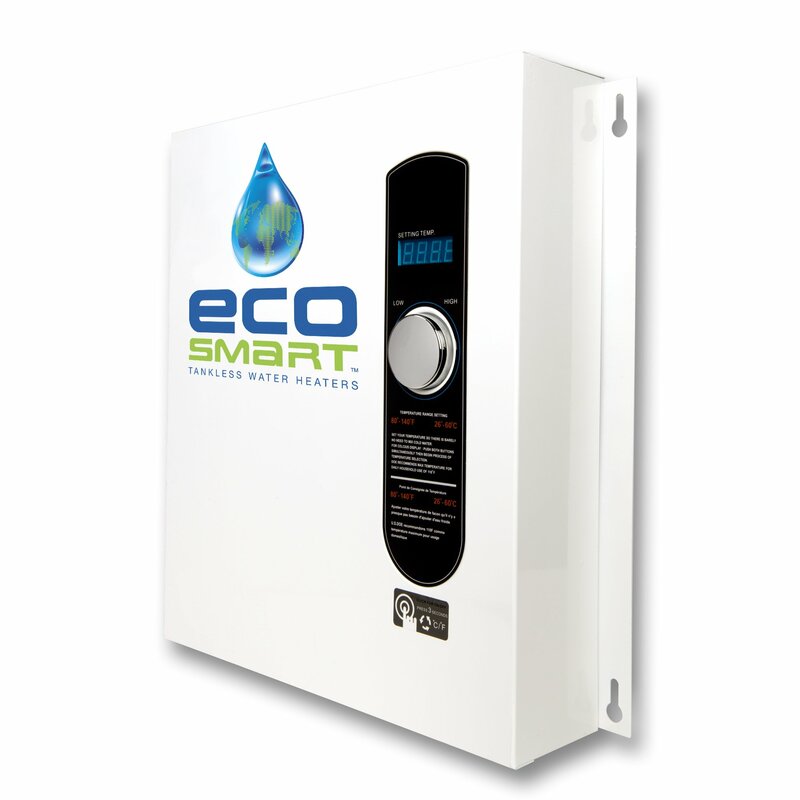 In other words, EcoSmart’s electric tankless models can operate using the home’s existing electrical service. On the other hand, installing a gas water heater, be it one that uses Natural Gas (NG) or Propane (LPG), requires pipeline installation when the house doesn’t have one, and an upgrade when the house’s old setup isn’t enough to cover the needs of the appliance. Choosing the right fuel for your tankless heater requires resorting to your personal preferences as they’re a crucial factor as well. For starters, some people refuse the idea of having gas lines going through their homes. That’s totally normal as gas is a dangerous fuel since an unnoticed leakage can be mortal because of the toxic components in gaseous emissions. On the other hand, you may be living in an area where natural disasters are frequent. Depending on the emergency at hand, one may prefer one energy source over the other depending on which resources stop working during the catastrophe. Finally, you may also consider how eco-friendly the tankless water heater is. Electric units usually have an excellent efficiency of over 98%, compared to an energy factor of less than 85% for gas water heaters. That obviously shows that electric models are far more environment-friendly than their gas counterparts, which may affect the decision-making process if you care much about nature. When you’re choosing your tankless water heater, the size is the most crucial aspect, as it determines how well the unit performs. The size depends on three factors; Incoming water temperature, the maximum desired flow rate and electrical service. 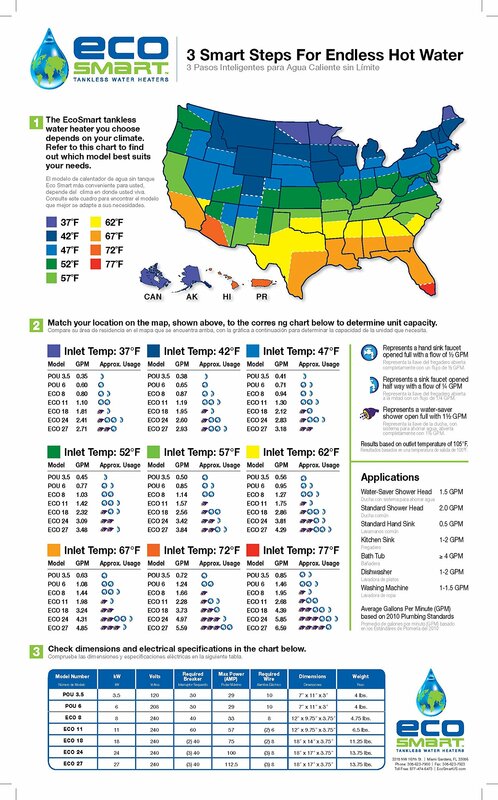 Basically, you need to determine the temperature rise, which is the difference between the inlet temperature (that depends on the average climate conditions) and the outlet temperature (which can be 105°F for showers, 120°F, and 140°F, which is the maximum level). The temperature rise is measured in gallons per minute, and it determines the maximum water quantity that you can heat at once. To choose the right size, you need to check your settings then refer to EcoSmart’s Size Map that takes the inlet water temperature into account to determine the maximum flow rate each model can achieve. EcoSmart’s ECO 27 model is an electric tankless water heater designed for those seeking a robust heating system for their homes. It measures 17 x 17 x 3.625 inches and weighs 11 pounds, making its installation easy in any location. Do not let the compact design fool you into thinking that this unit is weak though, for it’s a powerful machine capable of heating nearly 3 GPM at 37°F with a 99.8% efficiency. If you’re living in a northern area where the weather is too cold, this tankless water heater is for you. EcoSmart pride themselves in providing innovative products, which is reflected in their numerous features including the Patented Self Modulating Technology, and the Digital temperature control, which allows users to set the temperature in increments of 1 degree. Besides, this water heater is capable of handling special needs for specific appliances like Jacuzzi Water Tubs and houses in northern areas. What we like the most about the ECO 27 innovation-wise though is the remote-control feature. You can set the flow temperature of the water heater from anywhere in the house, which makes the whole process much more convenient. Just note that the remote is sold separately, but it’s definitely worth every penny. For the installation, you should note that this unit is rated at 27KW at 240 volts and consists of three individual heaters internally, each of which requires a dedicated 240 circuit, rated at 40 amps, and provided via #8 wire. Here’s a pro life tip: get a certified technician or plumber to install the unit for you and enjoy a lifetime warranty coverage. Getting a professional installation doesn’t come cheap though, so give it a good thought before jumping on your yellow book to get a plumber’s phone number. As for the safety, this unit is UL and CSA certified, making it safe enough for home and commercial use. Besides, you get a lifetime warranty that covers the cost of heater regarding any failure you may face with electronics and exchanger and element. This is yet another electric tankless water heater from EcoSmart, but the POU6 is a Point-Of-Use heater, not a whole-house one. This unit was made for under-the-sink installation thanks to its compact design, with 5 x 12.8 x 8 inches as a measurement and 1 pound for the weight, making it one the smallest and lightest tankless water heaters on the market. The unit features a maximum flow rate of 1 GPM, as it can get 1 gallon of water to 105°F at 72°F inlet, making it perfect for specific low-demanding applications like a Doctor’s Office, Wet Bars, Boats, RVs, and Kitchen Sinks. Consumption-wise, the POU 6 shouldn’t be a problem as this model, just like most tankless water heaters from EcoSmart, has a 99.8% efficiency. As for the installation, you should check your electric lines as the EcoSmart POU 6 needs at least a 100-amp electrical panel with a 40-amp single pole breaker connected to a #10 AWG wire. A professional technician or plumber must perform the installation process. This tankless water heater comes with a one-year warranty, which is standard for such an appliance. You should note that this tankless water heater increases the temperature statically, and it’s not modulated as it doesn’t have an inner thermostat. All in all, this water heater should be good enough to clean dishes and to have real quick showers, but you may face some problems if you’re living in cold northern areas or you’re looking for a unit capable of heating water in your hot tube. We wouldn’t be fair if we didn’t include a gas tankless water heater on our list, for many people still prefer this fuel over electricity for a variety of reasons. EcoSmart’s ESG-95 water heater is another excellent choice to consider in this category. The unit measures 25 5/8″ x 13 7/8″ x 9 7/8″ inches, which makes it the biggest model among our selections. Again, this product is environment-friendly, and it has an 84% recovery efficiency. 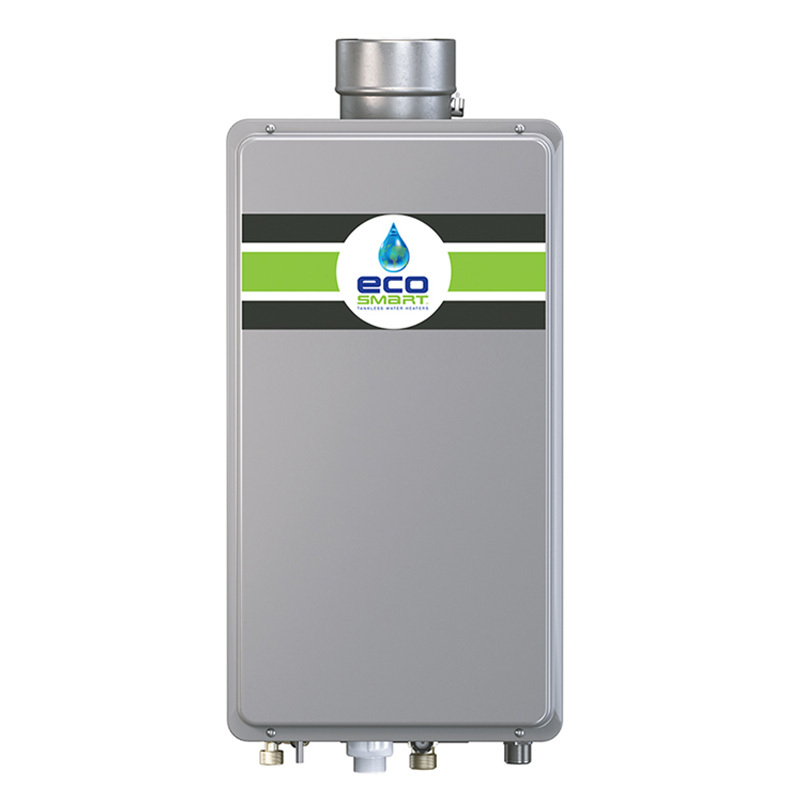 EcoSmart engineers really unleashed their creativity when making the ESG-95, as it has the industry’s lowest minimum flow rate of 0.26 GPM and minimum activation flow rate of 0.4 GPM. No matter where you are or how much water you need, this unit got you covered. And just like other EcoSmart’s products, this unit has a digital display for easy temperature monitoring, which, by the way, ranges from 85°F to 104°F. Installation-wise, this tankless water heater is compatible with 1/2” Gas line, and it doesn’t need an adapter to connect to Metal Fab. Inc., 3”/5” concentric venting. Besides, this model features a Self-diagnostic system for easy maintenance. What we really dig about it though is the Hot-start programming that keeps temperature fluctuation at a minimum during frequent on/off periods. It has a low NOx and a high energy efficiency thanks to intelligent temperature controls, making it one of the most environment-friendly tankless water heater. 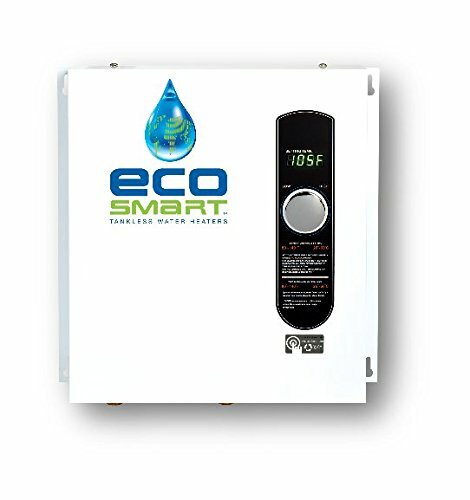 The EcoSmart ECO 27 is our go-to tankless water heater. It has perfect efficiency, easy controls, an ergonomic design, and great features, making it suitable for any purpose. On the other hand, if you only need a small water heater for the bathroom or a kitchen sink, the POU 6 model is a no-brainer thanks to its compact design and fast on-demand water heating capabilities. If you’re still found of gas and consider it the best fuel for home usage, you can’t go wrong with the ESG-95 model, especially if you need the water heater for commercial use. 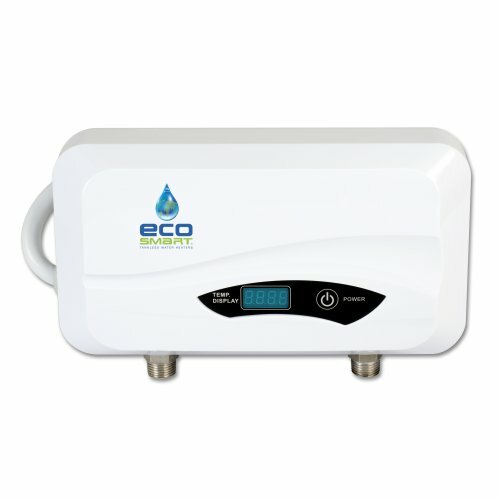 Whatever tankless water heater you choose, keep in mind that you’re in good hand as long as you buy your unit from EcoSmart, for it’s a company known for innovation, excellent customer support, and quality.